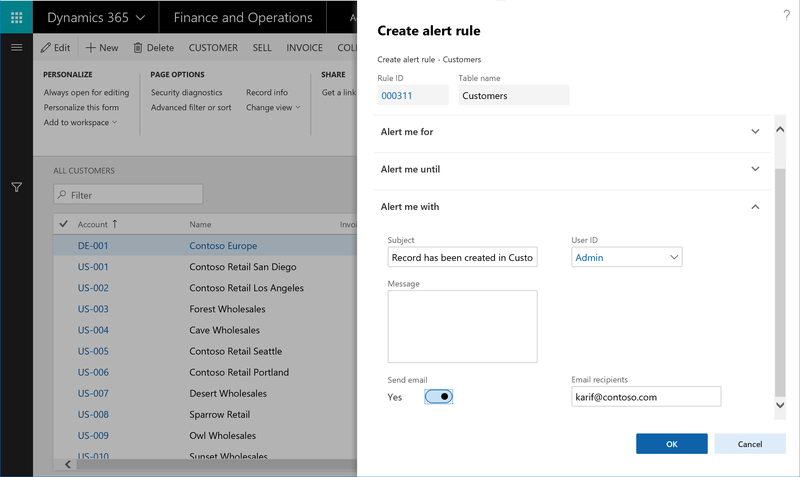 In Microsoft Dynamics 365 for Finance and Operations, you can define custom alert rules that monitor filtered views of data and automatically send email notifications when predefined events occur. The option to send email notifications is available for all supported alert types and can also be turned on for existing alert rules. You can use built-in controls to create alert rules that monitor the filtered views of system batch jobs. By monitoring the value of the Status field, you can also configure alert rules that send email when a batch job fails. After these alert rules are created, you no longer have to check reports for changes to business data. Instead, you can let the Finance and Operations intelligent change detection service do the monitoring for you. Client alerts depend on the email subsystem that is provided through integration with Microsoft Office. We recommend that you use the Simple Mail Transfer Protocol (SMTP) provider, so that email distribution doesn't have to rely on a local mail client. To send notifications by email, customers must configure integrated email services. Email notifications are sent to recipients on behalf of alert owners. For more information about how to configure email in Finance and Operations, see Configure and send email. The following image shows the Create alert rule dialog box, which now includes a Send email option. When the Send email option is set to Yes, alert notifications will continue to be delivered from the Action Center. The service sends email notifications by using predefined email templates that deliver the basic details of the alert notification. The following image show the structure of the alert notifications when they are received by email.